I wasn’t going to post here but was advised too. We had been going a really well around our house but the past month and 1/2 has been pretty hecktic. Jazz had an infection on her chin (not really discussing that here) but Bosch has had a couple things going on he had a scratch on his eye and then I noticed a lump on his hock area (bad area to have a lump) I didn’t think much about it and Saturday I had it aspirated. Figured it was just another lump that happened from being older. 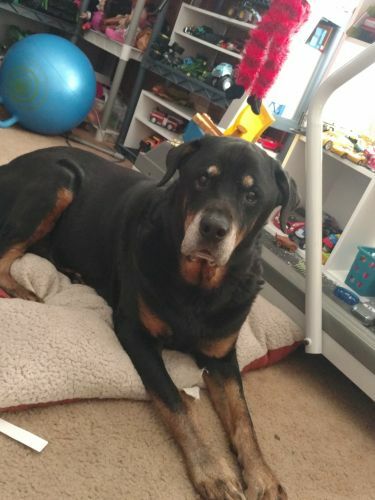 For those of you who don’t know Bosch is a 12 1/2 year old Rottie. He will be 13 on May 4. Back to the lump. Dr Truax who did Sassy’s amputation did the aspirate. There was bloody fluid when he did it. I knew that it wasn’t a good sign he said could just be infection. So he went and looked under microscope. Came back and said yes infection there but “Angry Cells” meaning the ugly C word. I asked what kind he said round cell tumor which can be mast cell or different type. We are treating the infection with antibiotics and going to follow up. Gave us several options first can do a debridement which means even if they can get the tumor out that they may not be able to close it up. Do palliative care and just let him live the rest of his life. He is not a candidate for amputation because he has arthritis in his spine and front feet. My decision would be to do palliative care. 1. because of his age I don’t even know if he could make it out a surgery and 2. Amputation isn’t a option. I did order Apocaps by Dr. D and going to get him on those. In my heart I know they helped Sassy. Just waiting on them to get here. the lump is next to that skin tag area. I hope the antibiotics help/work and Bosch is more comfortable. Will they/you do a pathology on the aspirate? Do you want to know? Spoil that boy rotten, not like you need to be told to do that! Michelle I’m so glad you decided to share this news. I know it’s not easy, almost makes it feel too real I’ll bet, but now you have even more people sending good thoughts and love your way and that’s gotta make a difference right?! I want to congratulate you on being so proactive with all your dog’s health but especially when it came to noticing and doing something about checking on this lump. You are the model pet parent my friend! YES! Now, you’ve been through the amputation ordeal. And you know Bosch better than anyone else, so your choice not to pursue any traditional treatment is the wisest, most loving thing you can do for him. We support you in that 110%! And yeah, I do think that going the holistic route can totally have a positive impact and maybe even shrink that little booger tumor. I’m sorry that you are even dealing with this situation, it’s definitely got to bring back sad memories and be so upsetting. But you can handle this. You are wiser and smarter than the first time around, and Bosch is benefiting from all that you learned while treating Sassy. No doubt that with your pawesome vet team and all of your vigilance about your dogs’ health, Bosch can go on to live out the rest of his life as a happy boy. Keep us posted on how he’s doing OK? We are here for you always. You know as well as anybody here- once you are here you are family forever and that includes all creatures! If the lump can’t be removed completely then don’t try and de-bulk it. Mast cells in the tissue make healing hard if not impossible. When Tani had multiple tumors we took some off with a punch which removed the entire mass but didn’t necessarily give good margins. Once when we did a FNA on one of Tani’s lumps it took weeks for the needle hole to stop weeping. Bosch should be taking benadryl and pepcid. The benedryl helps with the histamines released whenever a MCT is disturbed, and the pepcid helps with the stomach acid produced by disturbed MCTs. Prednisone can be effective in reducing the size of the mass if that becomes a problem. There are some side effects but if the mass is growing then it may be an option. Besides the tumor that was in her knee TriPug Maggie had at least 6 other MCTs, some of which we removed. Little sis Tani had at least 12 over her life. We removed 6 or 7 but then I stopped dealing with them as the other health issues needed more attention. Maggie lived 4.5 years after her first MCT diagnosis and did not pass from mast cell cancer. Tani lived to almost 15 and the mast cell tumors didn’t really affect her life or have anything to do with her passing. Dealing with any cancer is scary and hard for us who have been down that road before. And I know it’s hard to make decisions when what seem like the best options are not available. You do the best you can with love- as you do for all your dogs. I’m glad you posted here- the power of the Tripawds Nation is now at work for you! Dr T. suggested prednisone but Bosch can’t take that it speeds up his heart and makes him a psycho. I did call our holistic vet who does his chiropractic adjustments and laser. I have an appointment on Dec 20th for him. Going to get him started on Chinese Meds (Eastern Medicine). I am going to do everything I can to help my boy that is for sure. @Karen, Yeah no way was I planning on doing the surgery. His age is a major factor and where the tumor is also. Nothing I can say here that already hasn’t been said. You are an amazing pawrent. You always take the best care of your family and I can’t say I would do anything different than what you are doing. You know your babies and what they are and are not capable of. Bosch is in the best of hands with you and I know you will do everything possible to keep his quality of life top notch. I am really sorry that this is happening. I have no doubt it brings back pain and fear. Like your pack, you are a total warrior and you will kick this to the curb and stomp on it. Glad you posted, so sorry you had to. I was going to ask about Eastern medicine – I’m a firm believer in the herbs and such. Also, in the back of my mind I’m remembering a different drug for the histamines….could it be Apoquel? If it is mast cell, for some reason I thought this med was beneficial. Does anyone know if I’m remembering right? And yes, silly girl, you are family – it doesn’t matter how many legs your fur baby has! I know this is scary, but you are so much better prepared now than you were years ago. You’ve got this – and so does Bosch. Hugs! ARE YOU KIDDING ME???? You HESITATED avput posting about Bosch?? Have you gone stone cold raving mad??? To re-state what everyone has said as far as that “topic” goes, my goD Michelle, Bosch is our family, just like Jazz and just like Snickers! Sassy brought ALL of you here as HER family to join this family!! You, missy, are a very important spoke in the wheel that keeps this Trpawd community going! Now, about smiling, handsome, sweater stylin’, snuggly, Bosch. As sucky as this is,, as you already know, the chances of Bosch leaving his earth clothes on the bedroom floor due to OLD AGE are a very likely scenario!! As everyone has said, YOU know Bosch better than anyone. NO ONE takes better care of all your Rotties than you do and no one is more tuned into what’s best for them than you are!!! And as you can tell and because we are all family, none of us have a problem expressing our support for the path you are taking. Yes, if Bosch were a lot younger, then “maybe” the decision would be a bit more difficult, You are definitely doing what is in Bosco’s best interest . I’ve forgotten which Bet said this…I think it was somone who was highlighted here, palliative care IS a treatment AND it CAN extend life jist simply by the fact that it adds quality and being more comfortable! And besides, you have a very, very special Angel Sassy watching over her BFF Bosch……and your Tripawd Family is watching over you! I’m so sorry to hear about Bosch’s current struggle. I’m also sorry that you are having to go through this with him. He is such a handsome boy and you are such a good Rottie mama! I can’t believe he is almost 13! You are such a great tripawd source of inspiration and just such a good person. We are all thinking of you and your sweet boy. Going to get him started on Chinese Meds (Eastern Medicine). Good option! I don’t know why I didn’t remember this earlier but when I decided to stop treating Tani’s MCTs our holistic vet (who was doing chiro on Tani) came up with a menu and some Chinese Herbs. Did it help? Who knows, but it certainly didn’t hurt and I felt like I was doing something positive for her. And she loved the food by the way! Another thing that really helped her energy level was K9 Immunity Plus, I’ve never used Apocaps . Our holistic vet had us stop K9 Immunity when we first switched her diet and the decrease in her energy was dramatic so we added it back in. I am sorry to hear that! What I’m going to say now is not going to be a big consolation but I do believe that most old people nowadays eventually end up with cancer, one or the other, and probably most of our pets do, too. And I don’t mean they necessarily die from it or rather they can still live to quite an old age with it. I am with you on the palliative solution for many reasons and I know Bosch will have the best care. I also gave Apocaps and would again and I am glad that Karen can be such a useful host of information here. And as she said: the pug girls lived to old age inspite of the tumors. please feel hugged, I know this is hard on you but I am sure Bosch knows no difference, he just know your love. Thanks everyone. I got our first herbs yesterday we don’t see her until the 20th because I can’t get off work but she wanted to get him started. Its a herb wei q booster. Not sure what it does but i give him 2 scoops a day 1 time in morning & 1 time at night. So the 20th I will know more. …….. my tie to Sassy. As long as he is here so is she. Reading about the scoops of herbs…..really takes me back in time when Nitro got his Chinese herbs right after his surgery. As you know, he was not the greatest eater, and he would’ve starved to death if I’d tried to just sprinkle it on his food. I remember being in chat with you and Karma, chasing him as he hopped down the hall, trying to get him to eat his “herb-filled” meatballs. Thinking about it now makes me laugh, but I wasn’t laughing at the time. and, BTW, guess who’s banner was up when I clicked in here? Miss Happy Hannah herself! The Angels are watching over you and Bosch, Michelle. And that’s a heck of a lot of Angel Power! I have nothing to offer in a practical way – but a world’s worth of hugs and love!